I gravitate toward people who are passionate about their craft and unapologetic about how hard they’re willing to work to achieve their goals. Faith Cummings (@FCummings) is one of those people. By day, Faith works for a major fashion brand and by night she spends her time creating fashion and lifestyle content for Fashion Bomb Daily, xoJane and her own site Urban Sybaris. Prior to the trifecta of sites that I just mentioned, Faith honed her skills in the accessories closet at WWD, Coco & Creme, Clutch Magazine, Vibe Vixen, and Jones Magazine just to name a few. Here, Faith talks about how she balances both of her “worlds,” what inspires her and what advice she’d give to the next generation of ambitious writers and fashion addicts. H+S: You have a day job working with a major fashion brand, but you’re also a contributor for a number of fashion and lifestyle publications. How do you get it all done? FC: I learned time management at nine years old when I first started running track. I’d have practice right after school four days a week and a meet on the weekend, but I still had to get my homework and projects done, as well as hanging out with friends. That discipline stayed with me through high school, college, and is still crucial for me now. Without my calendar and to-do list, I wouldn’t have made it this far. I also have an insane work ethic – I can now admit this – and I’m pretty much always working. I love what I do, so I am not at all bothered by it and I take breaks and vacations when I’m feeling on the edge of burning out. H+S: What publications do you currently write for? 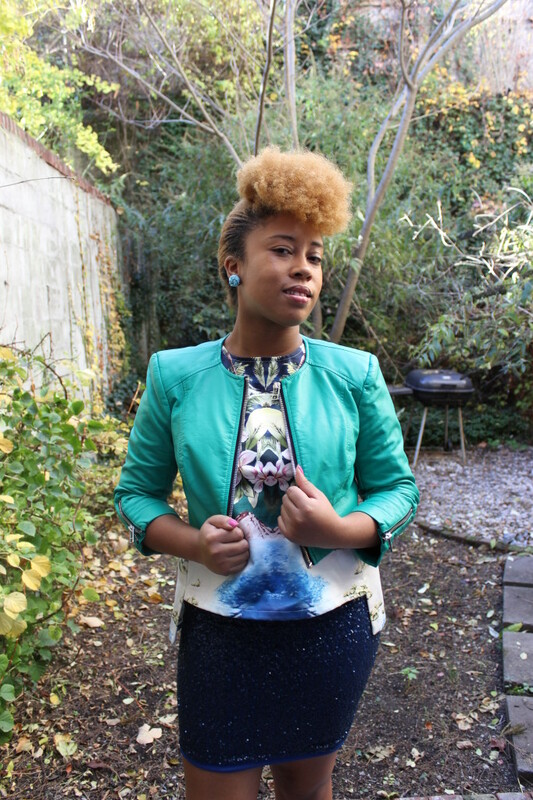 FC: I currently write for Fashion Bomb Daily, xoJane, and my own blog Urban Sybaris. H+S: What does a typical day in the life of Faith Cummings look like? Because you have a lot on your plate do you have to segment out your days by job? Or does it all just flow naturally? FC: It all flows quite naturally at this point, but gaining this sort of balance has been hard work. I wake up around 7am and check blogs and sites, looking for images of what looks celebrities have been spotted out and about in, fashion collections, and style news, as well as looking for inspiration for pitch ideas. After an hour, I get dressed and head out to work where I’ll be until at least 6pm, but more often than not past 8pm. Once I’m home, I delve into more writing and of course indulge in some TV; I’m addicted to it. I try to turn down by 1am. FC: I’ve always loved writing, reading, and wordplay. Magazines and books were my nourishment and I hoped to one day make my mark like so many of the writers whose words I obsessed over: Colette, Plum Sykes, Ken Follett, and Toni Morrison are high atop my favorites list. I also went to school for languages, so I had to be good at getting my point across in both my native English tongue and the other languages I worked hard to learn. Blogging helped me break into this world and I’ve been working on honing my voice ever since. FC: The biggest fallacy is that we aren’t as educated or knowledgeable in fashion’s past and present as those stationed on the [masthead] at magazines. I pride myself on devouring everything there is to know about this art form and though I probably can’t go toe-to-toe with Tonne Goodman, I’m happy to say that I do indeed know my stuff. I wish writers and bloggers would get more credit. We’re doing the work, even if the work isn’t within the confines of convention. FC: Work hard and work for free to gain experience. Obsession has always been deemed a dirty word, but you need a bit of it to make it. Stick with it and don’t let anyone deter you from your dream. FC: I’m looking for all kinds of things really from celebrity outfit IDs to the latest beauty products I can try out for a story. I find inspiration in almost everything, but the result isn’t always directly related to the pitch at hand. FC: I prefer email as it’s the medium I use the most. FC: The absolute worst time is during the middle of the day; between 1pm – 3pm. By that time, I’m bogged down with hundreds of emails and knee deep in work, so most often those pitches will fall by the wayside unless they’re really captivating. FC: I don’t really have any actually! I’ve dabbled in doing a bit of PR for brands in the past, thus I know how hard a job it can be. If I had to pick anything, it would be not tailoring pitches. There are certain brands and products I will never write about, so the mass emails are just a waste of inbox space and will make me less likely to open emails from a certain individual in the future. FC: I think humanizing one another and connecting in real time would do wonders for our relationships. Maybe it’s a phone call or a chance to get together and have a drink: we need to treat each other like people instead of just means to better our stories or get exposure for brands. FC: Sending me a personalized pitch is the best way to get me to respond, but even that is not always a given. I need to do better with responding to emails, something I’m working on in 2014, and I hope no one takes it personally when I do not. A reminder email always helps and even a tweet goes a long way in getting a pitch noticed. All that can be going above and beyond, but it definitely helps! FC: One of the things that makes fashion so coveted is its exclusivity. Social media and blogs have contributed to the doors being open to many more people than it ever has, but I think it’s a bit late to work on closing them. It feels like a slap in the face as some bloggers have just as much influence as editors do, but perhaps it won’t be the worst thing ever. Fashion Week is exhausting and though it’s an honor, looking at the collections on Style.com almost immediately after the show isn’t so bad is it? I had the most fun writing or working on…This is a hard one! I would say all of my previous content for Coco & Creme and the pieces I’m constantly working on for xoJane. Both have involved a lot of freedom to explore my voice and opinions which is always fun. I’m most proud of… My family’s pride in my accomplishments and the fact that I’m actually on a path to achieve all of my dreams. It hasn’t always been easy, but I’m so grateful and blessed every second. My dream interview would be with… Abraham Lincoln and Oprah. iPhone, Android or Blackberry? iPhone. I just got an iPhone three weeks ago believe it or not! I hated to say goodbye to my Blackberry, but I’m quite content with my decision. My 3 favorite mobile apps are… Seamless, Chase, and Paypal. I’m a practical woman. I have … unread emails in my inbox right now About 2400. It’s a problem. I’m working through it. A fun fact about me is… I watch Friends every single day. Reruns rule my life. You can find me… On twitter @FCummings.